8. Two books notes from me: I read two books this week that I absolutely loved. One is out right now and one comes out next week. First – Rock Hard by Nalini Singh – Tori reviewed it earlier this week, and I just want to reiterate what she says in her review. This book is awesome. It’s a big, ex-rugby, high-powered, cranky boss (T-rex) and a mild-mannered, scared (dealing with abusive ex-boyfriend) wonderful heroine (mouse) and zomg. The tension in this book. It will make you melt. Read Tori’s review and then read the book this weekend. So well done. I also demand more RV romances!! 6. I’ve mentioned how Neville Longbottom has grown up in the past, but I think we all need a reminder. Thank you Hermione for reminding us! 5. Do you want to know what your state is best at? Take a look at this map (click to make it bigger). I’m from Maryland and we are best at least accidental deaths. Yay? Is this all us Marylanders have to look forward to? What about best wine drinkers? Or best romance readers who also drink wine? Please take special notice of North Dakota. Ladies who live there – nice. 1. The snow is melting. My boys have made mud puddles this week. Spring is on its way for sure. This weekend I plan to read Hearts of Fire by LH Cosway – it’s gotten some great reviews. I enjoy this author quite a bit. Have a great weekend!!! Tired of mint? Do lime. A nice key lime pie perhaps? Or a lime & coconut cake? A little green food coloring would add extra flash…or green tinted sugar crystals. I always enjoy your Friday list, so thanks for another one. oooh! Key lime pie! Thanks for the lime suggestion! That was going to be my suggestion or lime jello shots. Mmmm… key lime pie. 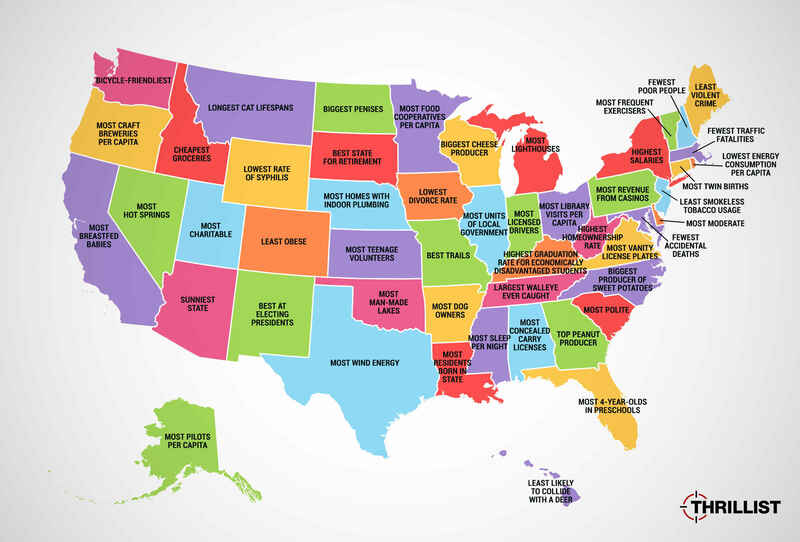 As a former Nebraskan, I’m so hoping that the Nebraska having the most indoor plumbing is per capita because otherwise that is a giant WTF for the rest of the country. Also, if only I’d known about North Dakota while living in Nebraska …. I want to know…WHO and HOW they determined that ND has the largest penises? No body contacted me to see if I was available with my measuring tape……I would have volunteered if needed. I even have a couple of measuring tapes….just in case !! You are so generous with your time! omg – I need this cake in my life!!!! Trust the Focus was a REALLY good read. I don’t care for lime (and a key lime pie should be yellow, anyway), but I love pistachio ice cream, which is green. My mother used to make a yummy no-bake pistachio torte (I think it was from a Jello-brand boxed dessert kit) that was also green.